New Baden High School "Zebras"
New Baden (population 3,001) is located in western Clinton County in southwestern Illinois. New Baden is located at the intersection of Il. Routes 160 and 161 just north of Interstate Highway 64. A nearby town of note would be East St. Louis located 26 miles to the northwest of New Baden. There is an un-named pond on the north side of town and the Southern Railroad runs through the south side of the city. New Baden was established as a town in 1838 (http://www.wesclin.k12.il.us/commun~1.htm) . The town was named for its many immigrants who hailed from Baden, Germany. In 1896 a tornado struck, demolishing nearly every building in town. The residents quickly rebuilt and changed the name from Baden to New Baden. The school system was probably established in the late 1800s. We learned that in 1913 the enrollment of New Baden High School was 14 students. NBHS served the community for nealy six decades when consolidation talks were started with its neighbor to the north, Trenton. 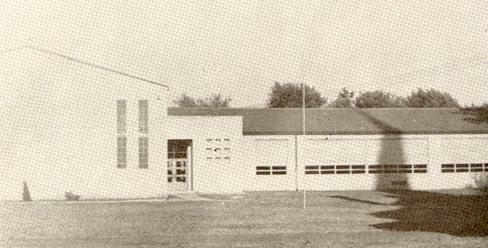 This consolidation effort succeeded in 1956 or 1957 with the creation of the Wesclin School District. The High School for Wesclin is located in Trenton. 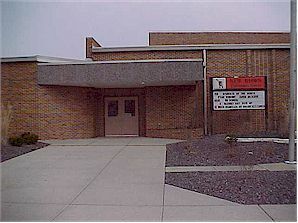 There are two elementary schools located in New Baden. It is not known if either school is the original High School building or not. A photo of New Baden Elementary School for grades K- 3 is posted above. New Baden also supports a grade school for grades 4 - 6 called St. George's. A photo of this school is posted below. School colors: Black & White? The New Baden Zebras definately played basketball. Their three District title trophies verify this. It is believed the Zebras may have also competed in baseball, track, and possible football. Assistance is needed from a fan or alum from the area. The best of the New Baden basketball exploits are listed below. The Zebra boys basketball te3am earned three District titles during their existence including two coming "back to back" in 1940 and 1941. Unfortunately the records and coaches names for these two teams are not available. If you have any information on these or other great New Baden teams please write to us at eganann@sbcglobal.net.